I couldn’t help but notice that Battlebond has a lot fewer references to tag team wrestling than you would expect for an expansion themed around two-versus-two duels. Still, the stunning reversal or comeback is definitely a feature of wrestling, though it’s often associated with heroic characters who may not always be black in Magic terms; but to be fair, Stone Cold Steve Austin and the Rock always walked that line between nobility and selfishness very skillfully. “Draw seven cards” is one of the most tempting lines of text in all of Magic, and has a high-level pedigree that goes all the way back to Timetwister and Contract from Below. The situation that Stunning Reversal leaves you in is rather precarious, but in some decks and game states in can be just what you need. Note that you don’t have to be about to lose the game because of something your opponent does – you can deal a bunch of damage to yourself with cards like Flame Rift and the like and then use this to draw seven more burn spells. It definitely has applications well beyond the obvious ones implied by its text. Talk about a fun card to review on my birthday. 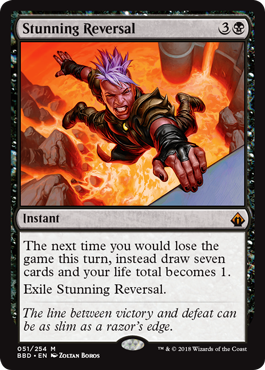 😛 Stunning Reversal is a quirky little black spell deserving of mythic rarity: save yourself the next time you’d lose in a turn (either by fatal damage or other means), draw 7 cards, and fall (or rise) to 1 life. Sometimes all you need is one turn to get out of a hole; unlike the other cards that block you from losing, this maybe gives you the resources you might need to turn around the game. Of course, if they have a burn spell, you’re dead to rights anyways after this resolves, and self-exile of Stunning Reversal means you will have a harder time casting it anew. But it’s a nifty spell that might give you the window to pull off a Stunning Reversal of your own…even if it’s not going to be reversing a whole lot in Legacy as a four-mana instant.